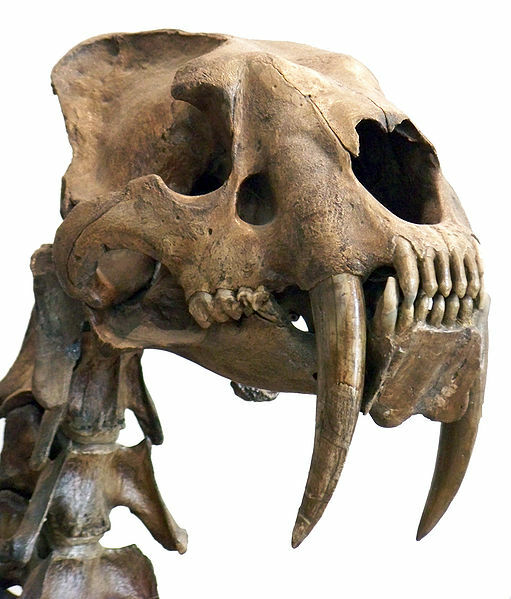 For those of you who do not know, Smilodon is the scientific name for what we like to call saber-toothed cats. Smilodon as a family will be explored right now but our main subject will be Smilodon populator. The only thing that really makes Smilodon stand out for the average human being, is the massive canine teeth protruding from their upper jaw. These teeth, depending on the species of Smilodon, could be a foot long and be exposed from the mouth a total of seven inches! That would be like sticking your whole hand out of your mouth. Even though these massive teeth would seem like a problem for Smilodon, but, as you can see on the picture on your right, the teeth were no problem. So, how did Smilodon use his massive teeth. Well, in our fallen world it seems he had a big purpose in them, striking his prey dead with one blow. Because these saber-toothed cats normally have big, long, stocky front legs they are much better and bringing their prey down to the ground and then searching for a weakness as the creatures thrashes about. When the neck is exposed and the windpipe in striking range, the teeth sink in and give the creature its last breath. Just imagine the scene. The Smilodon waits quietly in the breezy dusk. It is quickly getting dark but it is not a problem for Smilodon. His nocturnal vision kicks in and he crouches lower for the perfect opportunity. As the deer stop eating they hear a slight rustle. A split second later the Smilodon has gripped one of the deer’s sides. With its back legs anchored in the ground the Smilodon pulls back with its massive front legs and the deer collapses. As it kicks about underneath the grasp of the Smilodon it cries out and exposes it neck. A fatal error that is now history. 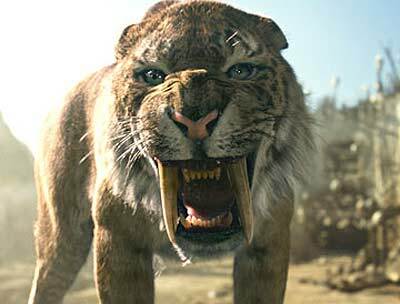 Only One could make such a creature as Smilodon. With its killer teeth, grand legs and surprising ambush it is no wonder that this creature fascinates people.